Feb wasn’t the speediest month to pass. So often I’m caught in time as a whirlwhind but Feb felt like the right speed. We had some snowy days and then some unseasonably hot days. I got to read a bunch and we’re totally caught up on DVR (which feels like a serious accomplishment). Our poor Bailee dog isn’t doing well. She’s been without an appetite, lost a lot of weight, and is severely anemic. We’re not sure what’s up but just hope she feels ok. Hands down, my fav meal this month was a little Valentine’s Day surprise charcuterie and tips to build a better charcuterie board. 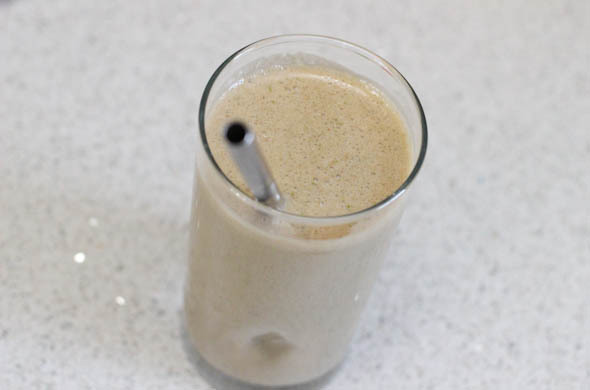 I was loving this healthified peanut butter, banana, and nutella smoothie…just as good as the original! 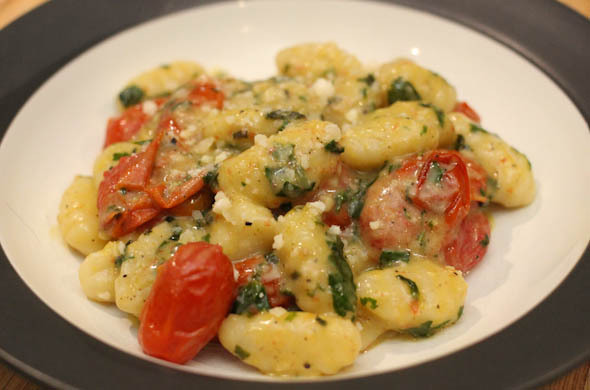 This super quick gnocchi with roasted tomatoes was the ideal, hands-free dinner. Perfect for chasing a toddler…or whatever you might be doing. Let’s bring on March! My birthday month!! His 2-year-old molars came in promptly! He had a rough few days but was just so dang cute saying “cheek huuurts”. He is loving painting & coloring. We’re marveling at what he knows. He coughed and I asked, “where did that cough come from” thinking he hadn’t been sick at all the day before. He answered “mouf”. True story. His fav food right now is jelly. Although rice is a tricky one to eat, he loves the challenge. He is hating coming inside from playing. He watched Mr. J cut his own hair and was mesmerized. Now he likes to make a buzz sound running his hand over people’s heads. 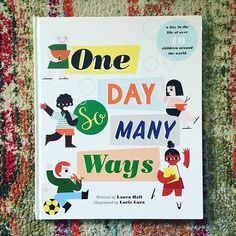 The little one is quite concerned about “Bab-ee sick?” so let’s all cross our fingers we all do ok.
do more dinner prep more in advance: Yes! I’ve prepped some doubles and got to pull a frozen one out once a week. watch more movies: Snowden left me befuddled. I was impressed by the story for Sully. focus on clothes that I really like: I capitalized on some Loft points + $20 off +a 10% off night. I took home a mixed media top, some clearance herringbone dress pants, and a sweater that’s more like a shirt. I decided to give my most-pinned-smoothie a healthified-twist. 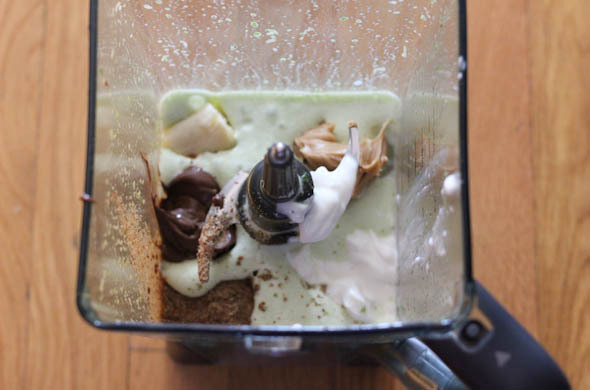 This smoothie started with peanut butter, nutella, banana, and yogurt. 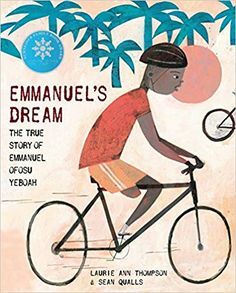 I put a few tweaks to it and loved it just as much! 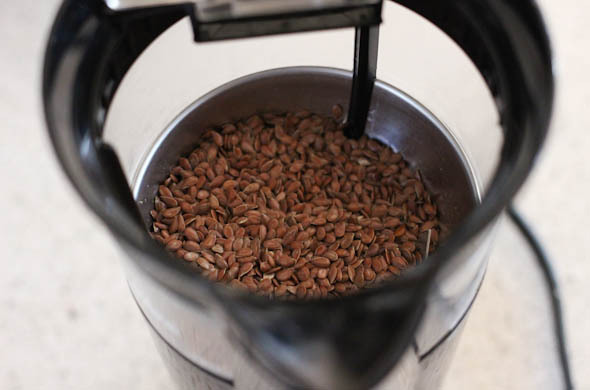 In a coffee grinder, grind the flaxseeds into powder. Blend the spinach, milk and then add ice and blend more. Add in the banana, peanut butter, nutella, yogurt, and flax seeds. Greek yogurt versus regular yogurt: Greek yogurt adds more protein, and is an easy change for this smoothie. Greens: who doesn’t need another serving of veggies? The spinach is so mild that it literally doesn’t add any flavor, just more veggies. Flaxseed: I got these when I was breastfeeding but they add fiber and omega-3s. I learned they’re best absorbed when ground. Noted. 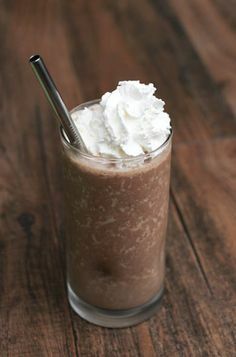 Or try the original Peanut butter, Banana, and Nutella smoothie. I make lasagnas at least once a year, and make enough to have it several times. This time, I made it as roll ups and loved how beautifully portioned it was! I made 1- 9×12 lasagna and 2- 9×9 pans of lasagna rolls. One dish of lasagna rolls got slated to my very awesome friend who is now a mom of infant twins with 2 bigger boys. The fam could prob could use freezer food, right? I made my own pasta this time too! It was so easy since it only takes the rolling on my Kitchenaid, and no cutting. I cleared a ton of room on the kitchen island and spread these out. I rolled the dough on the mixer, cut them a bit, cooked them, and then let them cool enough for the filling. I’ll totally make my own again! Here are my other lasagnas, if rolls aren’t your thing: Traditional Lasagna or Lasagna Soup or Butternut Squash Lasagna or White Lasagna w/ Chicken & Spinach. Prep the meat, cooking through and seasoning with salt & pepper if including meat. 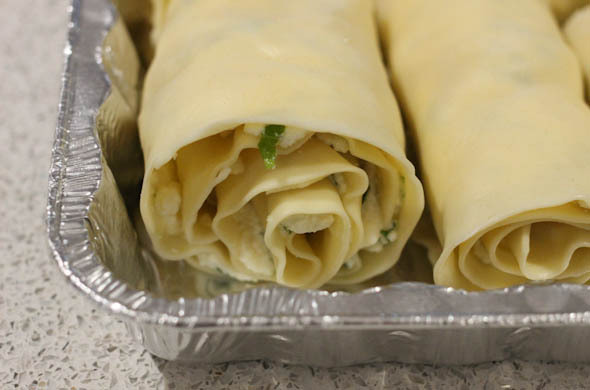 Mix together the ricotta, egg, and herbs. 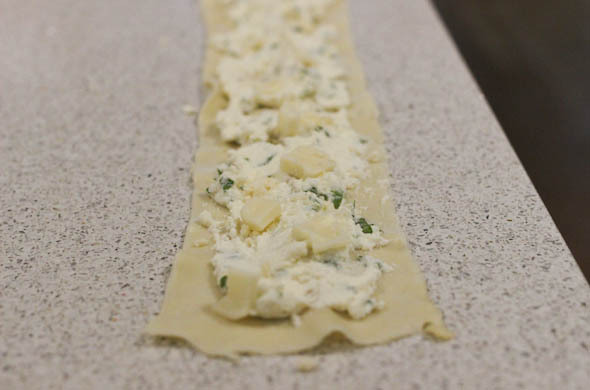 Lay out the pasta and spread the ricotta & herb mixture and top with mozzarella & meat mixture. Be sure to get the filling spread pretty evenly in a thin layer. Add on the cooked ground meat, if using any. Gently roll up from one end to the other. Aim for each roll to be about 2 inches high, any bigger and it’ll be a massive serving. Then place into a baking dish sprayed with nonstick spray. Top with sauce and freeze (or bake to eat right away). When serving, bake frozen lasagna rolls for 75 minutes at 350, adding additional cheese on the top for the last 5 minutes. Or let lasagna rolls defrost over night, or for 24 hours and then bake for 45 minutes with cheese for the last 5 minutes. The pan I’ll bring to my friend was in a disposable heavy-duty pan. I topped it with sauce and covered it in plastic wrap. It has a plastic cover where I labeled what it is with heating instructions but that flimsy plastic cover isn’t great in the freezer, thus, why I go with plastic wrap. I gave more instructions than necessary, but hey- nobody wants a baked plastic-wrap fiasco when getting dinner ready for the little ones! Here are other food ideas to bring to parents of a newborn. 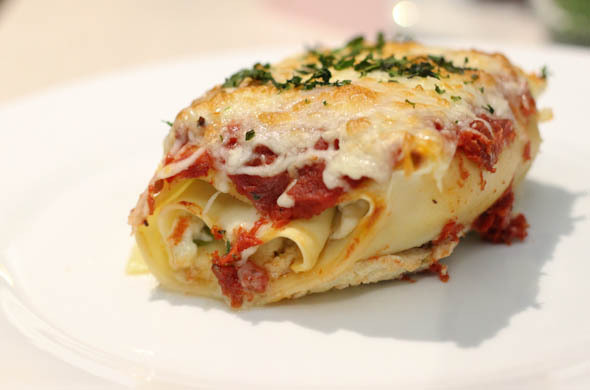 I seriously love lasagna, so I was very happy with these cheesy lasagna rolls. 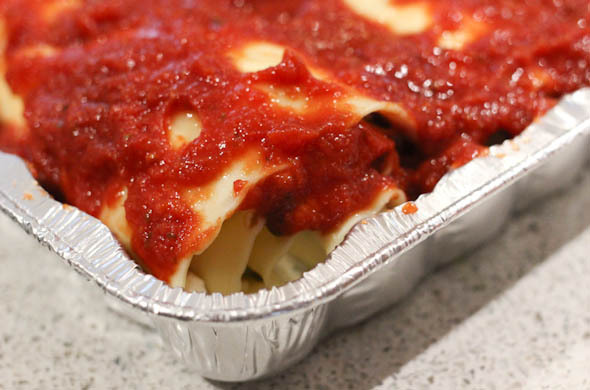 I’m the biggest lasagna fan in the house, so I was probably more into them than anyone else. Plus, we had just had regular lasagna a few weeks prior. I tried to spread ‘em out, but I also attempt to have at least 1 meal per week that is from a freezer stockpile of batch-cooking. I believe there’s also a chicken pot pie hanging out just waiting on me to call it into the line up! There’s zero cooking involved here but I was pretty into with my offerings for a charcuterie & cheese board. 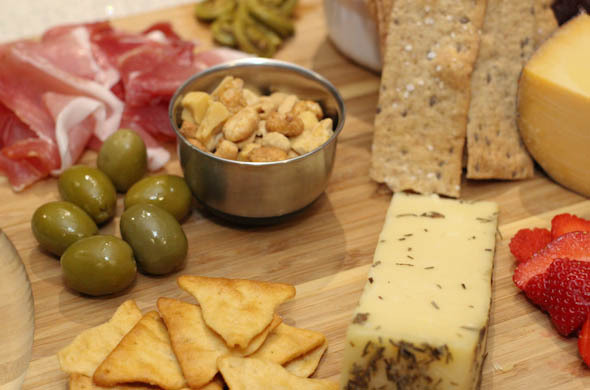 The reigning Queen of Cheese Boards is How Sweet Eats but here are my 2-cents. Mr. J and I enjoyed this for Valentine’s Day while the little one slept over with the grandparents. This was our meal, but now I’m itching to make one for a bigger crowd and to go all out. Tip 1: Start at Trader Joe’s…seriously, the cheeses won’t break the bank, as in, I got 3 totaling about $12. I choose a smoked Gouda, a rosemary Asiago, and a pepper Taleggio. 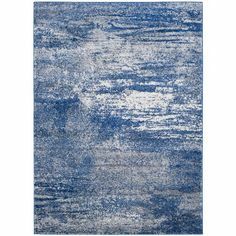 These aren’t widely different in texture, but we loved them. I hear Whole Foods will also cut any cheese wedge for you, so don’t get thrown by the whopping price, or if the size is too much. Maybe shoot for a crumbly, a softer, and a creamy one. I went with 2 meats, prosciutto & salami, for saltiness, fattiness, and texture. Tip 2: Variety is important. Multiple crackers/breads keep each bite feeling different. I choose multiple briney items (olives, marinated mushrooms, pickles, pickled fiddleheads) most of which I got in small quantities from the grocery store. Then I wanted different sweet touches (strawberries & jam), courtesy of our own regular fridge. I had nuts hanging around and more crackers than I realized which was perfect for all the toppings. 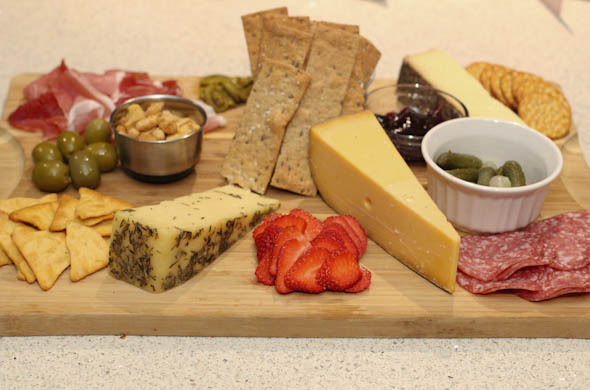 Tip 3: Crowd the platter. The plethora & bounty of offerings makes an impact. A few small dishes corralled a few elements, but for a bigger group, I’d totally pile everything up and sprinkle around for color. Pour the wine and crack into it! 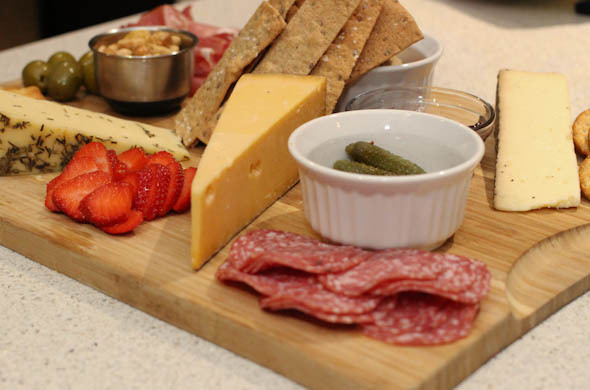 My kitchen island was born to host a bigger and even better charcuterie and cheese board. I could slurp this garlic butter, but I won’t. I’ll save it for the sliders. 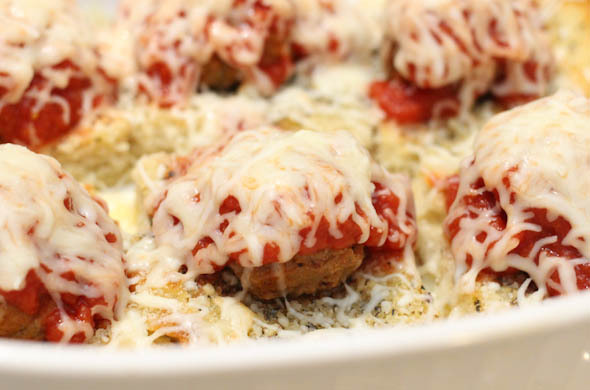 It is so perfect with a juicy meatball, gooey cheese, and a sweet Hawaiian roll. Yesssss. We all ate these and love ‘em. I would have liked a bigger meatball to match the size of the roll, but I used frozen meatballs making this 10x faster. The rolls were leftover and hanging out in the freezer from a NYE slider bar. I almost made the little one’s without the garlic butter. Then I stopped short, and thought: “Whattt are you doing???? You want the kid to eat all the foods, so give him exactly what the adults are having!” It might be from a running joke Mr. J has with the little one. When they couldn’t find it in the grocery store, they were saying “if you were minced garlic, where would you be?” The little one answers “no gar-ick”. He gobbled up his slider, so it was a good call to keep it the same. 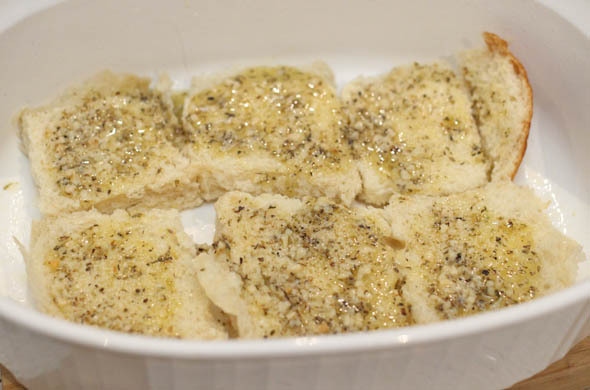 Melt the butter and mix in the garlic, Italian seasoning, garlic powder, salt, and Parmesan. Slice the rolls and spoon most of the garlic butter onto the bottom buns and bake for 10 minutes until they crisp a bit. Warm the sauce and meatballs. 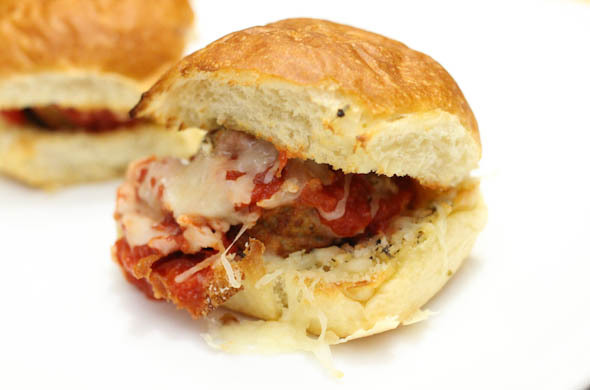 Place one meatball onto each bottom bun. Ladle sauce on top of each and sprinkle with cheese. Bake for 5 minutes to melt the cheese. Spread the remaining garlic butter onto the top buns and warm them in the oven too. Place the tops on and enjoy! I think the rolls & the garlic butter made these sliders. The rolls soaked the butter but then crisped so the sauce didn’t make them soggy. I’m so grateful that the 2-year-old eats everything and the garlic butter was a reminder for me to keep that going. Plus, he looooves meatballs so it wasn’t a hard sell. 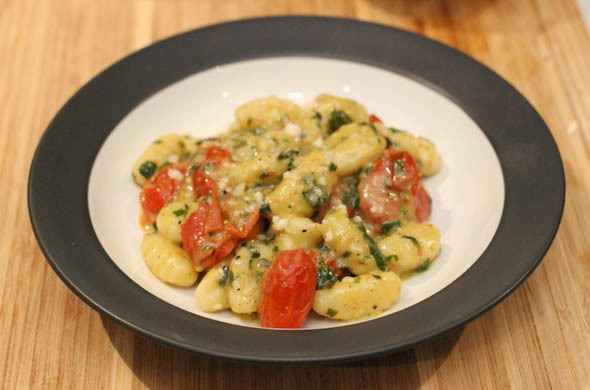 Gnocchi is a fav to have stashed in the freezer for speedy dinners, such as this! I made a really quick sauce and really focused on this dinner being meatless and flavorful! 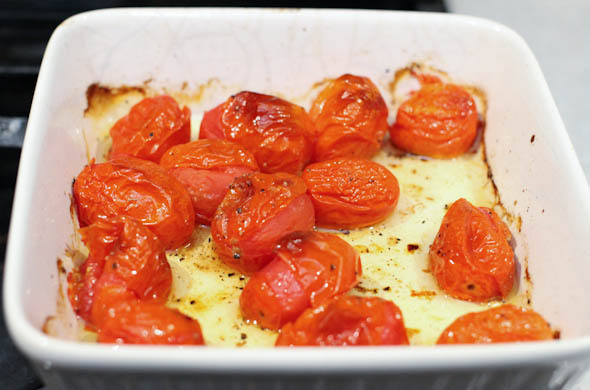 Drizzle the tomatoes with olive oil and sprinkle with salt and pepper then roast in a 400-degree oven for 15 minutes, until they blister and pop. Boil salted water and add in the gnocchi. Cook until they float. 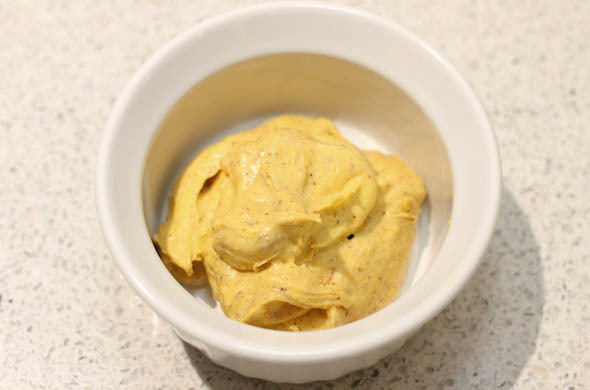 In a large skillet, melt butter and add garlic, and cream cheese to a medium heat. 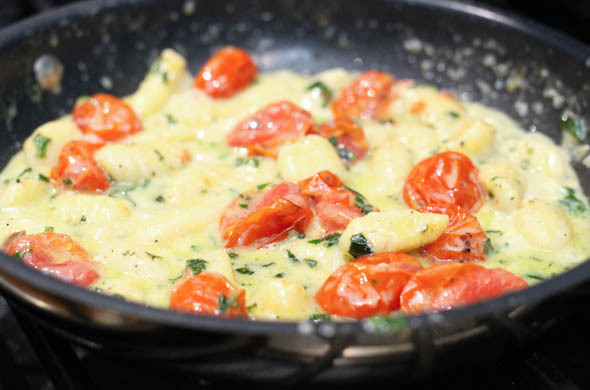 Bring to a simmer and add in the tomatoes and the gnocchi when cooked. Simmer and stir in the basil. 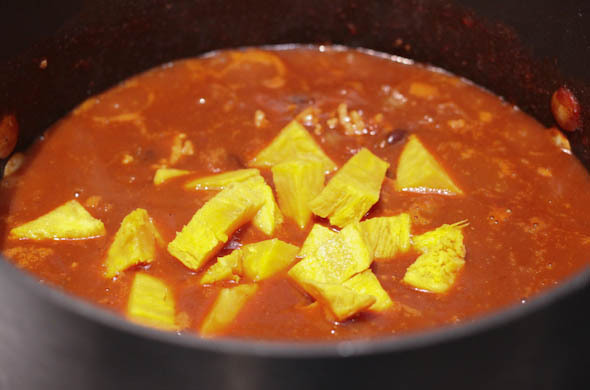 Cook for about 5 minutes to thicken and reduce a little. Serve with a sprinkle of parmesan. 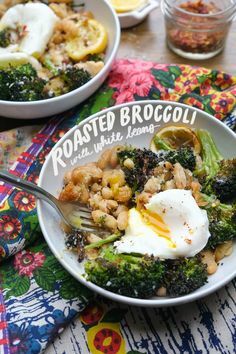 I loved the slight creaminess from the cream cheese but the lightness from the broth. I think this is a good trick to keep up my sleeve! 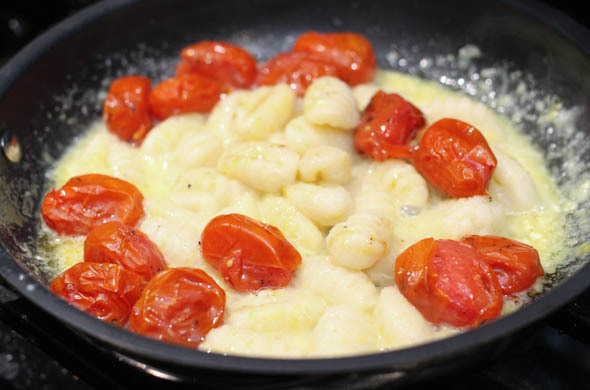 Tip 1: use a slotted spoon to scoop the gnocchi out, then there’s no colander to clean. Tip 2: I had a bit too much sauce so I used the slotted spoon to dish the pasta so the excess sauce stayed in the pan. I’m really only watching a superbowl for the snacks. Rooting for my home team is a perk, but the snacks, commercials, and half-time show are my focus…I mean really, I washed some dishes while they played. The little one learned to say “Go Patriots” which was really stinking cute. 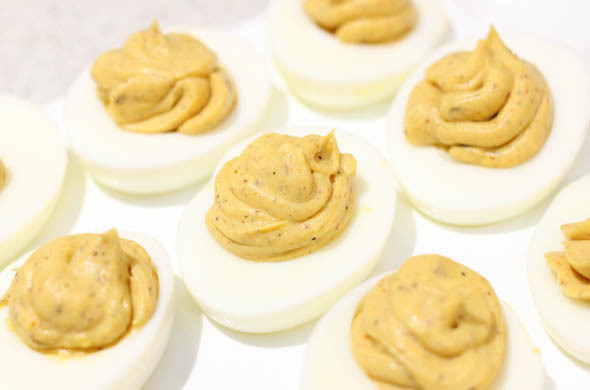 It was just us at home but we had festive sports snacks for dinner and I made just a few of these taco-spiced deviled eggs. I love that this is an app you can make as much or as little as you want! I topped ‘em with some roasted corn and tomato. The filling has my homemade taco seasoning but any would work just fine. Slice the eggs in half lengthwise. 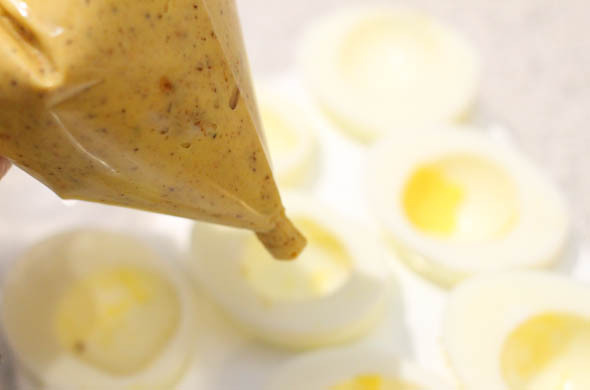 Pop out the yolks into a bowl (for a hand mixer) or into a food processor. Add in the mayo, taco seasoning, and lime juice. Then blend until no lumps remain. Add more taco seasoning to taste. Spoon into a ziplock bag into one of the bottom corners. Snip the very end and pipe into the egg whites. Fill each yolk divot then go back and top off each egg. Then you know how much you have to work with. Enjoy! Or refrigerate until serving! I liked the flavor. I think I’m done with the variations for awhile. 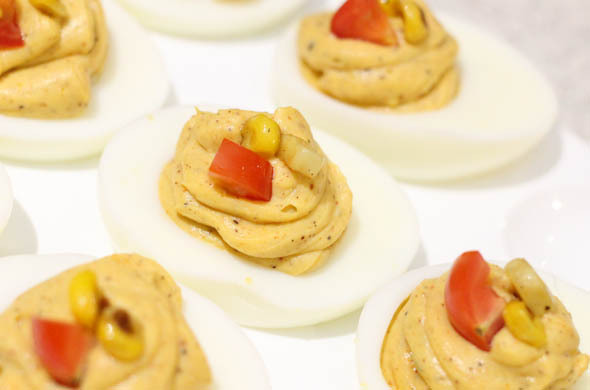 I made Sour Cream & Onion Devil Eggs then I made Bacon Ranch Deviled Eggs. This was the last variation I had in mind for now. Tis the season for all the cold-weather food. 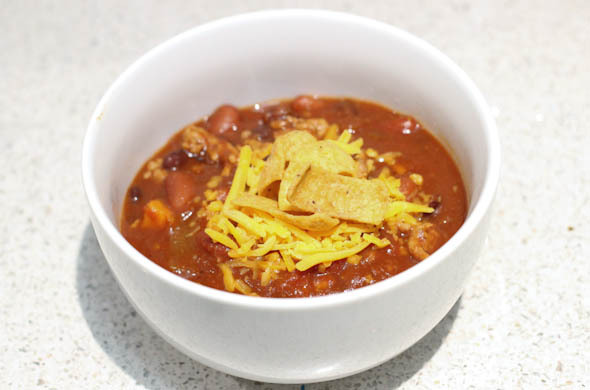 I wanted to re-do chili with a sweeter approach using some maple and sweet potato. Seriously, your next batch of chili neeeeds sweet potato. 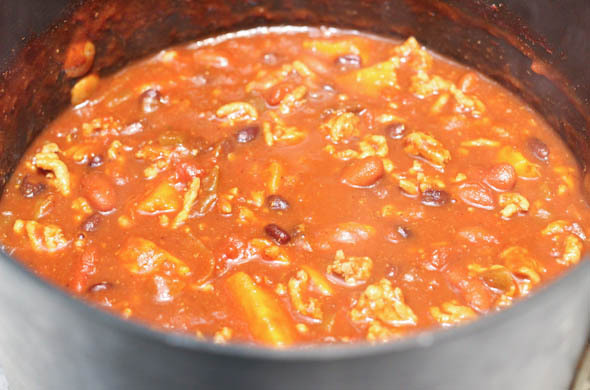 Even spicy chili benefits from a touch of sweetness and variety from the beans. I topped it with shredded cheddar and corn chips. It was great, and ensures plenty of leftovers! I prepped and cooked it a bit one night, then cooked again when serving it. The little one was into it! He loves beans but isn’t always loving foods all cooked together. Anything served with chips is a win with him! Brown the ground meat then drain off the grease in a large pot. In the same pan, saute the onion until caramelized and golden brown. 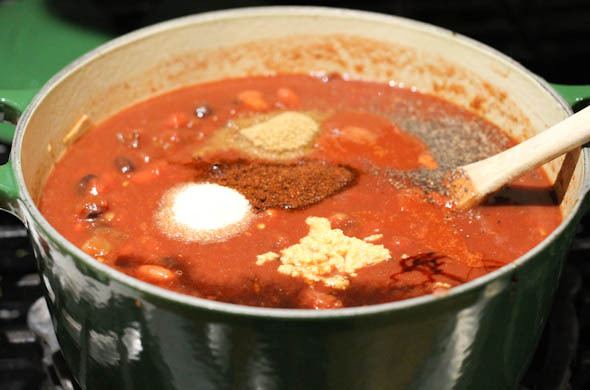 Then return the meat into the pot over medium-low heat, and add in the ground tomatoes, beans, garlic, cumin, chili powder, onion powder, pepper, salt, water, and liquid smoke. Cook the sweet potato, then chop and add into the chili. I loved the flavors without the heat. The sweet potato makes it filling, chunky, and flavorful. It freezes well too!